Ken Block's Gymkhana 6 drops tomorrow, and I can personally guarantee that it is over five minutes of awesome. Unfortunately you'll probably never be able to get up close with the real star of the Gymkhana series, the Hoonigan Ford Fiesta. Unless you go see Global RallyCross. When it's right there in front of your face. Yes. Yes. Yes. This. Yes. You may be under the impression that the whole Gymkhana thing is a bit of a one-off, a series of videos that live in nothing but their own bubble of themselves. You'd be wrong. 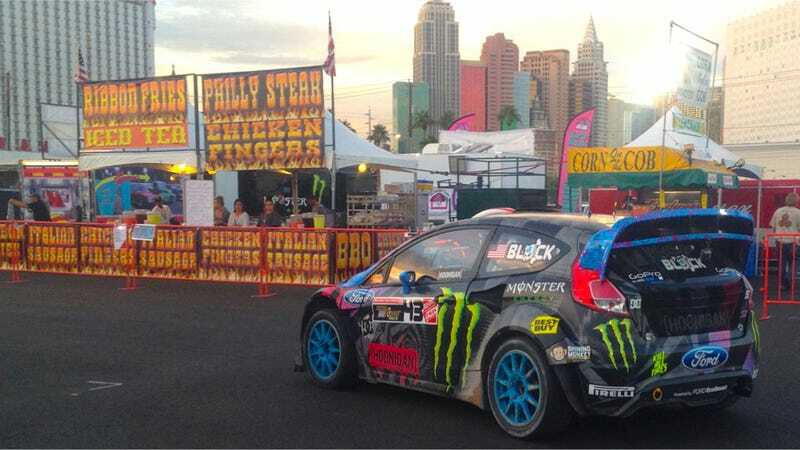 The car that Sir Blockington hoons around planes and bikes and hell, even a wrecking ball (insert Miley Cyrus reference here) is the exact same car that he races in the Global RallyCross series. Well, not the exact same car. The chassis, the body, almost everything about it is the same. Except in GRC, there's even more power. I was lucky enough to attend this week's GRC race on the Las Vegas Strip, as it ran on one of the nights during SEMA. In truth, I had never been to a rallycross event before, and I wasn't really sure what to expect. Sure, I'd seen it on television as its own thing and also as part of the X Games, but being at a sporting event and watching it on TV are often two wildly different things. So I had an open mind. In case you're not familiar with the sport of rallycross, it combines a little bit of street racing with a huge dose of rally, and they keep it all on a short closed course. Racers run different heats to qualify, and it all adds up to a big ten-car final. The cars are loud, tough, and fast as all hell. Zero to 60 comes in somewhere around two seconds. Talking to Ken in between races, he explained to me that his Ford Fiesta in the GRC is actually pumping out somewhere between 600 to 650 horsepower. For the Gymkhana videos, the whole thing is actually detuned to somewhere around 550, mainly for controllability issues. Any more than that, and he's way too easy to shoot off the course rather than hold an amazingly gorgeous slide. What struck me immediately, perhaps moreso than even the cars or the drivers or anything else, is how close you can get to everything. Like, really really uncomfortably, dangerously close. Which, let's be honest, is the best kind. Except for the mechanic shot above, which I took in Hoonigan Racing's tent (which isn't really much of a tent and it still lets you get about five feet away from the car), I tried to just see how close I could get as a spectator, to get the feel for the Masses. Too often you're handed a media badge and people let you walk everywhere all willy nilly and it's easy to lose perspective for how most people end up seeing it. In GRC, there's never a danger of that. The whole event was held in a parking lot literally on the Las Vegas Strip, and yeah, there were bleachers if you wanted to watch the race, but if you just wanted to explore there wasn't much stopping anyone. Walking the grounds, there were 650 horsepower beasts moving through the crowds, eager to make repairs in time for the next heat. Everyone's very alert, so there's no real danger, but try getting this close to Sebastian Vettel's Formula One car and let me see how you do. Every time the Hoonigan Gymkhana 6 Car, which is the official name that I just made up, would pop and snort, you could feel it in your teeth. Yes, you could literally feel it in your goddamned teeth. That is how close you can get. Big driving stars that not only include Mr. Block Himself but also guys like Top Gear USA host Tanner Foust, WRC driver Henning Solberg, former F1 drivers Scott Speed and Nelson Piquet, Jr., and skateboarding and BMX legends Bucky Lasek and Dave Mirra all race in the GRC series, so it's basically enough star power to outshine the light on top of the Luxor. Oh, and it's not uncommon to find them just walking the grounds, either, as they dash from their pit to watch the other races. Oh yeah, there are explosions at the end. You can call that a gimmick if you want, but I don't care. That's what I call just plain awesome.